Kevin Costner delves into horror with Anchor Bay‘s The New Daughter, a creepy, if somewhat unoriginal creature feature. 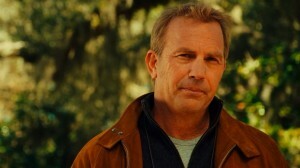 In the film, Costner plays the recently divorced father of two, a young boy and a teenage girl with plenty of attitude. In an effort to give his children a new start, Costner, a writer, moves the family to a new house out in the middle of nowhere. As any good horror fan knows, that’s the first clue that something creepy is about to happen. Sure enough, the daughter, played well by Spanish sweetheart Ivana Baquero (Pan’s Labyrinth), develops an unhealthy love of a large mound in the woods (the second creepy clue) near their house and goes from troubled to TROUBLED, in the process becoming … the new daughter. Based on a short story by John Connolly, The New Daughter is directed by first-time filmmaker Luis Berdejo, who succeeds in keeping the creep factor high. Shadows, screeches in the night, strange noises and glimpses of creatures that are not human build up viewers interest. But the movie lacks somewhat in its human characters. Costner is okay as the out-of-his-element dad, but he’s a little wooden, as though uncomfortable with the film. The script, adapted by The Haunting of Molly Hartley‘s John Travis, is partly to blame, but Costner is much better in his baseball flicks (Bull Durham, For Love of the Game) and even the thriller Mr. Brooks. Samantha Mathis (The Punisher) also stars, in a bit of a forced role as a possible love interest for Costner, but she tries to make it her own. And Erik Palladino (Buried) is good as the local police officer. The movie didn’t get a theatrical release, but the picture of Costner sporting a rifle should attract an audience. And fans of creature films or creepy movies such as The Wicker Man will find enough to enjoy in The New Daughter. The DVD has an interesting enough behind-the-scenes featurette, including interviews with Costner, the child stars and the filmmakers. They seem especially proud of the work put into the development of the creatures. There’s also a handful of deleted scenes, some of which offer a bit more insight into the movie’s characters, such as one with Costner and his ex-wife. Yeah I wish they had left that scene with the wife in.